The women of the Waverley family -- whether they like it or not -- are heirs to an unusual legacy, one that grows in a fenced plot behind their Queen Anne home on Pendland Street in Bascom, North Carolina. There, an apple tree bearing fruit of magical properties looms over a garden filled with herbs and edible flowers that possess the power to affect in curious ways anyone who eats them. For nearly a decade, 34-year-old Claire Waverley, at peace with her family inheritance, has lived in the house alone, embracing the spirit of the grandmother who raised her, ruing her mother's unfortunate destiny and seemingly unconcerned about the fate of her rebellious sister, Sydney, who freed herself long ago from their small town's constraints. Using her grandmother's mystical culinary traditions, Claire has built a successful catering business -- and a carefully controlled, utterly predictable life -- upon the family's peculiar gift for making life-altering delicacies: lilac jelly to engender humility, for instance, or rose geranium wine to call up fond memories. Garden Spells reveals what happens when Sydney returns to Bascom with her young daughter, turning Claire's routine existence upside down. With Sydney's homecoming, the magic that the quiet caterer has measured into recipes to shape the thoughts and moods of others begins to influence Claire's own emotions in terrifying and delightful ways. As the sisters reconnect and learn to support one another, each finds romance where she least expects it, while Sydney's child, Bay, discovers both the safe home she has longed for and her own surprising gifts. With the help of their elderly cousin Evanelle, endowed with her own uncanny skills, the Waverley women redeem the past, embrace the present, and take a joyful leap into the future. For generations, the Waverly family has made their home in Bascom, North Carolina. Each of the Waverly women possesses a unique magic which has made them a curiosity in the town, but their oddness also keeps others at a distance. Claire is a caterer who uses the enchanted herbs and flowers in her garden to prepare exquisite dishes that affect the eater's feelings. Claire’s aunt, Evanelle, gives odd and random gifts that she knows the recipient will need in the future. Her younger sister, Sydney, has a knack for creating just the right hairstyles for her clients. Even Sydney’s daughter, Bay, has a special talent for knowing just where something (or someone) belongs. The fun starts when Sydney flees with her daughter from an abusive man and returns to the home she abandoned. Claire’s quiet life is suddenly thrown in turmoil, and both sisters are forced to deal with their past. Claire gradually succumbs to the charms of the man next door, and Sydney finds love with a childhood friend. 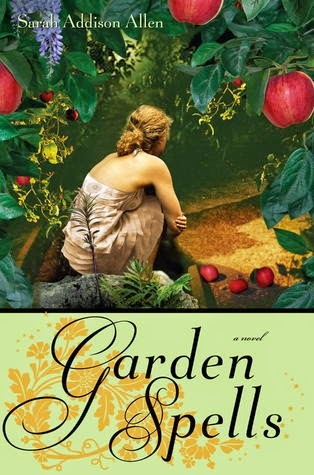 Garden Spells was a light, pleasant, and enchanting romance that was just a little too sweet, sentimental, and predictable for me. The men are too good to be true, the villains are stereotypes, and there’s very little conflict. I loved the big and cantankerous apple tree with a mind of its own that throws apples at unsuspecting victims. Not my cup of tea, but should please those readers who like magic, love, and happy endings.